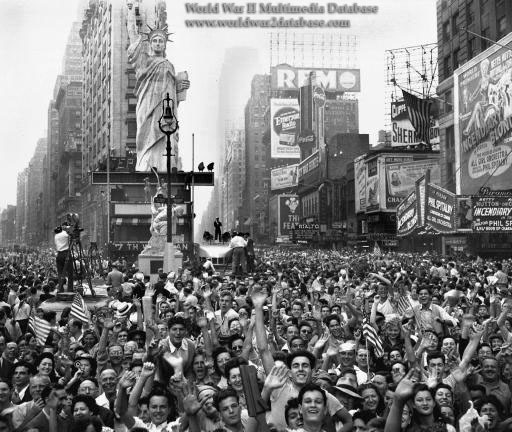 Crowds in Times Square Celebrate V-J Day on August 14, 1945 following announcement of Japan's acceptance of Postdam Declaration of unconditional surrender. A crowd of 750,000 people, buzzing with hope and excitement, had gathered in Times Square, eyes fixed on the Times Tower. At 7:03pm, the words finally blazed across the news zipper: “OFFICIAL – TRUMAN ANNOUNCES JAPANESE SURRENDER.” Times Square exploded in a collective cry of joy and relief. By 10pm, the crowd had swelled to more than 2 million, as New Yorkers flooded the Square. Dancing and celebrations went on into the night. Note mockup of Statue of Liberty and below that an effigy of the Iwo Jima Flag raising.